Before we start I should add a caveat to this article: I am a philosopher and a Daoist. As such, I suppose, I am open to accusations of bias and a lack of objectivity. This is unavoidable. However, if one wants to know about racing horses, one does not talk to just those who gamble on horse races. I offer only my own understanding of the form and that is limited. I do not claim to have a “monopoly on the truth” or to being in the business of converting people to Daoism. Any mistakes of fact are all my own. “Yes?” they ask, waiting on my answer, clearly forming the opinion that I can’t be a very serious Daoist without being able to enunciate at least that. “It’s complicated…” I manage after a ruminating struggle, made all too plain on my face. Some people would perhaps even get it from that. It is possible a new Buddha would be created by the universal satori (enlightenment) brought about by reading my blank message. Stranger things have happened and there are documented examples of people having satori’s while gardening and doing the dishes. If it were always that easy for everyone then we would all be Buddha’s by now. Indeed one of the ideas in Daoism and Buddhism is that you already are a Buddha, but have merely forgotten it. NOTE: Daoism is the translation into English of a Chinese word. There are two ways of doing this. The old way invented by the English, translates it as Taoism. The newer way, invented by the Chinese themselves, gives us Daoism. Both mean the same thing. That is why the city of Peking is now known as Beijing. The city didn’t change its name, the way we translated it changed. I will always use the Chinese way. It is all around you, in you, linking the universal heartbeat and behind your eyes. If I am starting to sound like Master Yoda from Starwars, well now you know where they got the idea of The Force from. Reading the DDJ raises more questions than answers. The DDJ is a very old collated-series of ancient sayings, it points to no deity and has no single author. It is attributed to Master Lao, but he almost certainly never existed and what remains was already ancient when it was collected into the current form and split into the two parts. The Chinese did exhaustive research into trying to find Master Lao, but eventually gave up. Trying to force these sayings into some sort of fully sensible and coherent form is one of the major hurdles one has to come to terms with when reading the DDJ. Indeed, it has thousands of translations into English and all of them fail to capture the original perfectly. I have 20 copies in formats as diverse as podcasts, Penguin editions, master scholarly works, bowdlerised poetic rewrites and iBooks digital copies. All are different and all are, as the famous saying goes, “Fingers pointing at the moon. Concentrating on the finger means you miss the heavenly glory above”. You miss the point. The same goes for the other major Daoist work in English, the Zhuangzi. Unlike Master Lao, Zhuangzi did exist (around 370 BCE), but he also only wrote part of his famous book. However, what a book! Zhuangzi’s work is a core text in the movement of scepticism and relativism. He is mostly concerned with wondering why people try so hard to split the world into dual notions, such as “Right and Wrong”, “Good and Evil”, “Smooth and Crunchy” and more importantly, “I and Thou”. He criticises these things by telling funny stories. In these he shows, gently, loftily, that trying to over analyse situations is almost always to commit a fundamental error. His stories tell of people who just “do” rather than think. people such as cooks, craftsmen, swimmers and butchers. People to whom reasoning is of little use in their activities, in the sense that a Cicada-catcher is attentive to his task and heedless of the doubt of “thinking too much”. He just catches the bug. Master Zhuangzi is poking fun at people’s perceptions in order to show them that most of the things they over-think and rationalise are actually the arms holding them back from being happy and free. Zhuangzi would probably be labelled a “free spirit” today, but his work isn’t a dreamy loose fantasy, his mind is sharper than a razor. It is chock full of epistemology (How do we know “what is true”? How do we get knowledge?) mixed with an attractive humour missing from most Western religious texts. Zhuangzi was a detached master flowing with the world and not against it. Once Zhuangzi dreamt he was a butterfly, a butterfly flitting and fluttering around, happy with himself and doing as he pleased. He didn’t know he was Zhuangzi. But he didn’t know if he was Zhuangzi who had dreamt he was a butterfly, or a butterfly dreaming he was Zhuangzi. Between Zhuangzi and a butterfly there must be some distinction! It is at this point that a lot of people give up; having fumbled with the subject, but found no clear answers, they leave it safely on the shelf. Only the stubborn continue to look further into it and even those robust investigators may not like what they find. Reading into the history of Daoism brings no golden age of philosophical freedom, in fact it brings up many “types” of Daoist endeavors full of cults, crazy gods, Celestial Masters and drinking mercury to live forever. To western eyes this part is a real turn off. In their defense they simply ignore Daoism’s history and focus on the two books mentioned above. Thus you get the “break” between Religious Daoism and the so-called Philosophical Daoism. Let me assure you that break is not really there. It has been created by philosophers with limited access to the works of the subject and taking the small parts they see as something else from all the dress up and dancing. In fact the religious practice is an expression of the Dao. The strange Celestial Master Daoism found in China today is also an expression of the Dao. For Daoism is a religion and not a simply a philosophy. That it is a hard to understand and essentially mysterious religion does not change that it contains a religious experience at the heart of it. That is a necessary part and cannot be worked around by wishful secular longing for an Eastern path that doesn’t “get weird”. Without that you won’t be able to stick at it long enough to “get it”. So, I am going to take up the challenge of communicating “what is Daoism” in two parts. Firstly, I am going to give a brief history of Daoism. That’s the easy part. Secondly, we are going to, if not capture lightning in a bottle, at least be standing atop a hill during a thunderstorm with our fingers in the air. Daoism: a short historical primer. Please note: While the following is a gentle line drawn through the history of Daoism, I am not suggesting that Daoism has a linear progression in the same way as the churches of Europe. Hence, I have not written this history with many names and dates that would become “milestones” in the movement. Daoism is a very large and diverse subject and China is a very large country with space for all sort of “interpretations”. In fact Daoism encourages interpretations. Daoism started as a shamanistic collection of cults and religious practices in ancient China (around 1000 BC). It mingled with the folk religion of nature worship and a few principles stuck. These are such ideas as personal transformation, which is the commonality in all Eastern religions such as Buddhism and Hinduism. This principle first took the form of talismans, mysticism and external alchemy that was basically trying to find ways to produce potions and become immortal. That proved popular and many cults and sects were merrily trying all sorts of poisonous brews to become one with the gods in heaven. Around this time (4th Century BC) some written works appeared that would later become the most recognisable Daoist thoughts such as the DDJ and the Zhuangzi, while a man called Zhang Daoling codifyed Daoism into a religion with a canon and gods after a spectral visitation from Lao Tze. Eventually this transformed into the idea of internal alchemy (3rd century onwards). No longer searching for elixirs, the Daoists searched inside themselves through such practices as meditation, sexual magic and living in caves. This practice gave us the notion of “chi energy”. Daoist priests, philosophies and practices were in the heart of the Chinese culture and even with the arrival of Buddhism it remained a driving influence in China even for hundreds of years. There were even Daoist states in China back then. Song painting in the Litang style illustrating the theme “Confucianism, Taoism and Buddhism are one”. Also worth noting is that religions were not split by class in China with Daoism being the stuff of the country folk. Emperors were Daoist, Daoist priests were at court performing ceremonies to keep the country in harmony while farmers followed the paths of Confucian thought and family structure. Over these years Daoism gave rise to many of the things we take as Chinese, such as Tai Chi, the Ying Yang symbol and speaking like Master Yoda. Chan Buddhism (heavily influenced by Daoism) was practiced in such places as the famous Song monastry of Shaolin, but after much persecution moved on to Japan, and became Zen Buddhism. One of the ways of “getting” Daoism is to “get” Zen Buddhism as they have heavily influenced each other. Eventually, Daoism and Confucianism met with the unstoppable force of Maoism and were both sublimed and crushed in equal measure. The Maoist revolutionaries knew that they could never totally eradicate Daoism as it contains a large amount of “folk” belief that resides in the cultural psyche and so they selected a particular form of it and put the governmental stamp on it. It has had gods and deities at some times and not at others. It has been an immortality cult for while and contained shamanistic magic at others. It has “borrowed” from Buddhism, but also given back to the middle path. It has had celibate priests in the heart of empire and yet has had sexual magic practiced in the mountains. It has two main books translated into English, but neither author knew about the other, neither would label themselves as Daoist and at least one of them is legendary. I can appreciate the problems in trying to understand such a changing and seemingly constantly moving target! Western intellectuals have worked hard for hundreds of years to try to bring the wisdom in Daoism under their command. The traditional method of doing so is the finding of commonalities amongst the various beliefs. After all, no matter how many strange and diverse Christian sects exist; they all believe in Jesus as the Saviour; that is what makes them Christian. It is what gives them their religious comfort. Daoism is eventually just as comforting, but given the five contradicting points above this is not an easy exercise. The trick is to realise that these actions are an attempt to “express” the Dao, but there is no “true way”, indeed anyone claiming to have one is always false. For this reason, Daoism has at its heart the understanding that everything is relative. Another method, and one expounded by such philosophers as Alan Watts, was to not only draw a line between the various “Daoisms” of antiquity, but to highlight by reference to the religion it most heavily influenced; Zen. One of the main ways in teaching Zen is through the master ignoring his students. Often the master will reject a new applicant outright and in such a forthright way that the student will give up there and then. “I have nothing to teach you,” the master will say. The pupil will, if he is earnest, persevere with the master and many stories and legends abound regarding this strange situation and how various adherents have dealt with it. The most famous story is told of the Indian Zen Master Bodhidharma, who rejected a pupil again and again until finally the pupil cut off his arm and demanded an audience. The great master agreed to meet with the pupil and took him under his wing. The Master truly had nothing to teach. Zen is about coming to your own realisation. It takes a lot of time and work and the master will help you, although not in a way you might appreciate. Should he accept you as a student then don’t expect to receive anything that could be construed as an “answer” to Zen. That is, don’t presume that Zen has esoteric knowledge and concerned only with moving through stages of learning. In fact, the most similar western experience to Zen training is probably Army Drill School. The army takes in “normal” people and turns them into killers; people with the will to kill. This is not easy. They do this by working you physically until you drop, regimenting your life and stripping you of your identity until you can be mentally reprogrammed. Zen is similar to this, but instead of forming you into a killing machine the Zen master strips you of your illusions, pares your personality down to its core and then makes you look at yourself. He does this by forcing you to answer impossible riddles, making you work in the fields, attend very very long ceremonies and hitting you with a stick if you are not meditating properly (or even if you are). This effort can take a lifetime, but finally you break the distinction between body and mind, between self and universe and wake up. You realise that the personality you hold so dear, that special “me” you think is yourself, it is a blank sheet of paper with no writing on it. It is not there at all. You are not apart from this Universe at all. Zen is a form of psychoanalysis! Daoism is similar to that, just without a Japanese guy hitting you around the head with a stick. In Daoism you have to hit yourself. Daoism is therefore like many religions from the East in that they all believe that you can transform yourself through training. This training involves mastering meditation and learning to live in the “now”. This means not allowing your mind to float into dreams of the future nor reminiscences of the past. To the Daoist , the future doesn’t exist, the past doesn’t exist, there is only the present. There is no set way to do this, no definite doctrine to follow and no master to teach you. There is only yourself, the books, other Daoists and a number of self then universal realisations on the road to understanding. Be they sudden or slow, they will come to you. 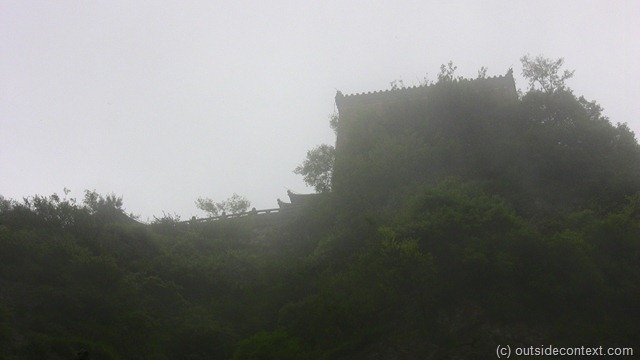 There are many Daoist mountains in China, but one of the most famous is a mountain called Wudang Shan. 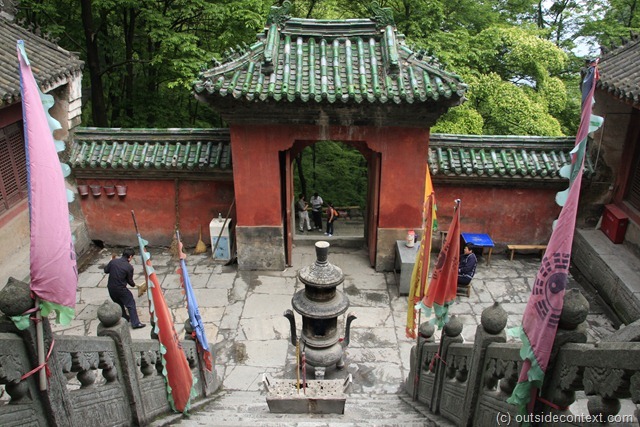 It is famous for being the birth place of internal Kung Fu styles such as Tai Chi. Walking up it is quite an experience. 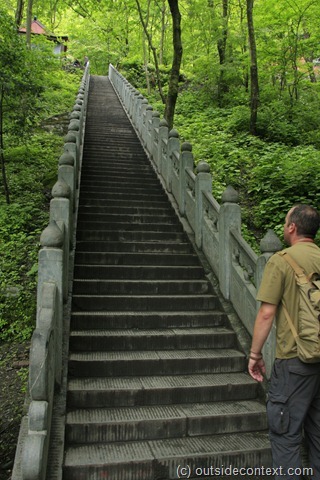 There are 20 thousand steps up Wudang before getting to the top and it is an exhausting journey. The endless stone steps tower above you, winding upwards seemingly into the heavens. Along the way there are many temples and the steps often lead you through the courtyards. Each of these temples has an increasingly strained mystic name which each subsequent temple tries very hard to trump. So the harmony temple may be followed by the grand harmony temple, the majestic temple of great tranquillity and so on ad nausea, all the way up the steps. This naming convention seemed to me at the time to be a cute cultural translation and something quite un-purposely funny, but actually it had a definite point; the idea that you are rising to heaven and every time you think you have made it: you haven’t and there is more to go. Along the way you meet many people on the same journey. You see rich and poor alike. The rich are carried up in palanquins, totally breaking the point, and this is most discouraging. More encouraging, but not perhaps comforting, are the groups of little old Chinese ladies you meet that even at the tender ages of what looks to be 150 can hop up the steps like a herd of mountain goats. After hours of climbing you arrive at a large temple and then upwards still more until you finally come to the top, which is above the clouds. You are here at the pinnacle of China’s attempts to reach heaven. 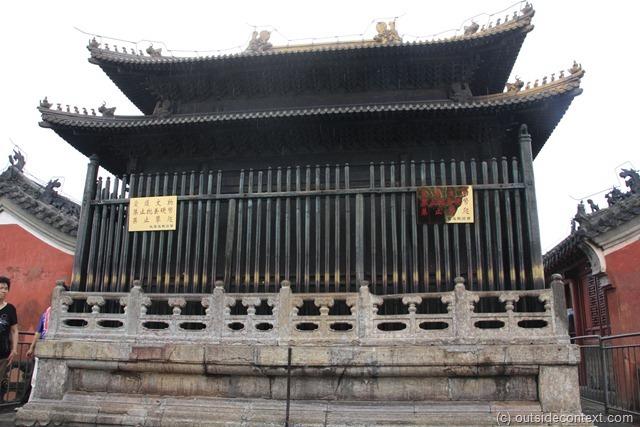 Here sits a large golden temple and some very old Daoist priests. After an age you have to walk back down and find some hot water for your strained leg muscles. For me, and I didn’t know this at the time, I was not the same guy walking down. My trip into the clouds had prompted me to leave something behind and to gain the courage to be what I wanted. Experiences like that are something of a slow burn for most of us. It took another two months before I felt a change in myself and what I believed. I suppose that was simply how long it took me to “check” my beliefs inside. Most of the time people simply remember that they believe something, but they don’t check. Many religious practices are geared towards sustaining belief so you don’t have to check it. 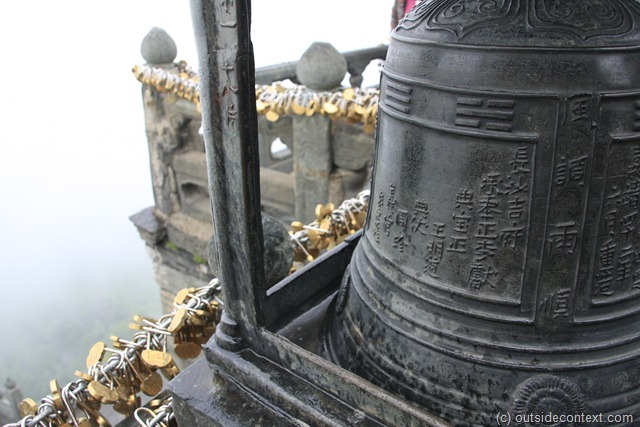 So, what exactly are the beliefs of a Daoist? There is a reason that Western films and culture like to steal gently from the Daoists. It is because Daoism concerns itself with something that is all around us, that it the fundamental core of us and indeed the core of everything, but is hidden from view. Scientists have worked out that the elements that make up the human body are the same as those found in the core of stars. In its beginning the Universe was not even. If it were, if matter was laid out in neat rows, then galaxies, stars and life would never happen. Instead the gaps in the lattice of matter mean that gravity acted to pull matter together. This process eventually collected enough matter that it underwent collapse and exploded, leaving behind a star. In this super-heated ball, more advanced elements formed up in layers inside the star. At the end of its life it no longer had enough energy to hold itself up and collapsed. Because of the layers of elements, energy was released in the form of an enormous explosion that we call nova (super-nova and hyper-nova). This burst of energy, released by the star’s death, flung the more interesting and exotic elements into space. But, as before, these elements are uneven and some formed, through the attraction of matter to matter by gravity, into planets. On one particular planet the elements gave rise to life and. by forming complex molecules with strange chemical patterns, this life ate, reproduced and died. It also “evolved” under the same principles and eventually formed a creature; the first animal. This animal, our common ancestor, swam around the primordial soup until it too reproduced and died. After it came generations of new creatures: faster, stronger, and more determined. One of these took the most important step on behalf of life on Earth. It took a step onto the land, giving rise to larger animals and eventually to humans. Through all this the elements that make up those creatures haven’t changed. They are still the remnants, the sparks and debris, from those exploding stars. You, me and everything around you is formed of those elements. You may have imagined that you are apart, that you were born into the world without being asked. That you don’t belong to it. Actually you grew out of this Earth in exactly the same way that an apple grows out of a tree. You’re a fruit. You’re a cantaloupe. You are not separate from the world, you cannot be separated from it. And you know what? Neither is anything else. Look out into the country and you will see the light play across the hillsides. Can you separate the valley and the hill? Just because one side is dark and the other light? The whole world, the whole Universe, is fundamentally connected. It is the nature of the Universe. It is the way the Universe works. It is the mysterious Starmaker, it is the spirit behind the beating life-energy of spacetime. You cannot grasp it, because it is chaos, it is formless, it appears passive because it works on such a grand scale that nothing you do bothers it. All life is sustained by it and would not exist but for it. All things return home to it, and it does not claim mastery over them; therefore it can be named as great. Because it never assumes greatness, therefore it can accomplish greatness. Taken in this way, one see’s that all creatures share this world with us, that all races are simply one and that compassion for others is the way of the Dao. The Universe wants you to live with it. It is ready to catch you if you accept it. If you want to be happy then live in accordance with the Dao; the life energy of the Universe. Ah, well, now you know why Daoism has changed so many times. How can one live in accordance with a mysterious spiritual nature that defies the understanding? There are a number of ways, and the DDJ, Zhuangzi (among the other Daoist works of which these are but the central texts of a huge canon) have many things to say about how to live with the Dao and in accordance with it. That which things get in order to live is called De. It is virtue in the sense that a medicine has the virtue of healing. For the Daoists, this virtue comes from living in accord with the Dao. So, if you act with wisdom and inner integrity then you are having a positive effect on your life and expressing De. In other words if you wish to be a “good man”, do so. Don’t wish it, do it. If you can achieve the focus “on the now” required to be able to move from wishing for things to doing them, then you are expressing De. When they clearly understand the Dao and De (Virtue), they then understand benevolence and righteousness. A person like that could ride through the sky on the floating clouds, straddle the sun and moon, and travel beyond the four seas. Neither death nor life can cause changes within her, and there’s little reason for her to even consider benefit or harm. Wu Wei is “non action”. Acting without acting. This does not mean “doing nothing”! It is best thought of as “not forcing.” For me I bring my martial arts to the fore with this principle. In martial arts the most masterful skill is in getting maximum effect for minimum effort. Many martial arts are based around finding and mastering ways of achieving this. But, they basically follow the idea of a fulcrum. A fulcrum is a pivot point and the point at which other things can revolve with multiple times the effect. In the martial arts this is best seen in the soft styles that enable even the most gentile motions cause tremendous results. I was once thrown by Don Bishop who is a 7th Dan in Shodokan (Tomiki) Akido. He asked me to attempt a stab at his stomach using a rubber knife. Now, Don is in his 70’s and a small frail looking old man. However, looks are deceptive for he is one of the powerful martial artist I have ever encountered. But, how does he generate so much power in such an old and small body? I, 6ft 2 and 18st, lunged at him as hard as I could. Don gently moved aside and using only one finger on each hand pulled me in such a way that I totally over balanced. Then, at the perfect moment, he changed the position of his fingers only by a few inches and suddenly I was thrown right over my own head. He had moved hardly at all, hardly used a jot of effort and yet had thrown me across the room. Was this magic? No, this was Wu Wei. Another example I can give was with another martial arts master. 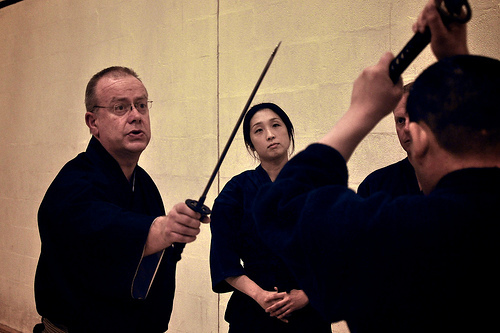 This time it was Kendo sensei Jeff Humm of Hizen Dojo in London. He was giving his normal end-of-lesson berating to the class and singling out a few choice lessons for black belts and beginners (like me) alike. He was explaining to a senior grade about a counter to a head strike technique. After a few puzzled looks he tutted and called for a training-sword. “Hit me,” he said to the student. Now the sensei was not in armour and not wearing a helmet. He was also just standing there in his glasses. The pupil, naturally, performed the strike very slowly and gently. Sensei Humm waved his hand, “No no no, with effort.” The class slightly held its breath as the student drew back his hand and with a brilliant loud scream flashed his training-sword down at the sensei’s unarmoured head. The sensei was no longer there! In fact at the absolute precise moment he had moved very slightly so that not only did the students sword miss, but he had somehow cracked the student a clean ringing blow on the top of the head. I sat watching this dumbfounded by the skill. Acting while not looking to act, that is what it means for me. The essence of his life is perfect. He can cry all the time without losing his voice. His inner harmony is supreme. To be aware of inner harmony is to abide with reality. These principles, together with many others detailed in Daoism, help me try to live in harmony with the Dao. I am, of course, only human and not a master at it, but I persevere (without trying too hard to!) All the principles combine and complement each other and gives rise to the truly virtuous human being. And eventually to becoming a sage. A person who masters the principles and lessons of Daoism, who lives perfectly in harmony with the Dao. He/she is The Sage. The concept of the sage is key to Daoism. The sage is the master of life, but he is also a man who sees reality as it is. As I have said in my prior articles on philosophy: many of the things we cling to in the world are not actually real, they are figments and creations of the person thinking them and culture that they live in. Human judgement on “what is right” and “wrong” or “what is beautiful” or “ugly” are in the mind of the speaker, not the universe. Following the principle of Wu Wei, the sage realises that it is our clouded minds that create these distinctions and judgements and he refrains. Thus, Daoists do not see the world as a toy of man. This is why they are often said to be deep lovers of nature. They realise that man is a part of the animal kingdom and do not consider man to be other than an animal. However, Daoists also realise that life requires that one creature eats another so not so many will be vegetarians. A dead animal is a dead animal. It should be respected, loved, cared for but to eat one is no bad thing. They realise that ethical judgments are fraut with peril and that there is no true man-made morality. Nature has a way. Not that Daoists suggest we all become troglodytes! Just realise that much of the intellectual and rational “truth” we take for granted is nothing more than “models” of the truth, tellings us only one perspective and not, perhaps, something that we should rely on. Daoism has no celestial monarchic view of the universe, it can accept what it likes. Many Daoists have great respect for religious masters, but most are not and cannot be “believers” in the Christian sense. Many Daoist are big fans of Buddha, but are not “Buddhist”. Other Daoist hero’s include Ghandi and other Indian masters. In many ways the sage is similar to Plato’s theory of the Philosopher King. A man of great natural wisdom: living within nature and strong in will, but able to see what must be done. When he acts it is gentile yet powerful. Such a sage has no fear of death, but more importantly he has no fear of life either. So, that’s a little bit about Daoism, what it is for me. As I said at the top “It’s complicated” and yet simple. I always keep in mind the first lines of the DDJ and I always try to capture the humour of life found in the Zhuangzi. I don’t think I have a compete understanding of it, but I am trying all the time to learn and appreciate more about this most amazing of religions. Daoism is like a template on the nature of reality and the Universe. One can believe in a god and still be a Daoist, and indeed this is the form found today in China. One can certainly be a Buddhist and a Daoist. One can even follow many of the teachings of the Christ and be a Daoist. Following the Dao, using De and Wu Wei brings the person naturally to gain the “Three Jewels” of Compassion, Moderation and Humility and these, I hope you agree, are some of the highest virtues of all. A good soldier is free from violence. A good fighter is free from rage. A good winner is free from competition. A good leader is humble before the people. Or the application of the strength of others. If you would like to know more about Daoism, please leave a comment.